Verify the conditions listed below do not exist. Carefully inspect the control solenoidvalve assembly connectors and pins-(1, 2, 4, 6) for the condition. Repair or replaceas necessary.DamageBent pinsDebrisBroken retaining tabContaminationVerify there is no metallic debris inside the connectors near the terminal pins. Cleanas necessary.Verify the control solenoid valve assembly solenoid leads-(3) do not have contaminationor metallic debris. Clean as necessary.Verify the resistance between the leads of each solenoid valve is within the rangein the table below, with the solenoid valves at room temperature. 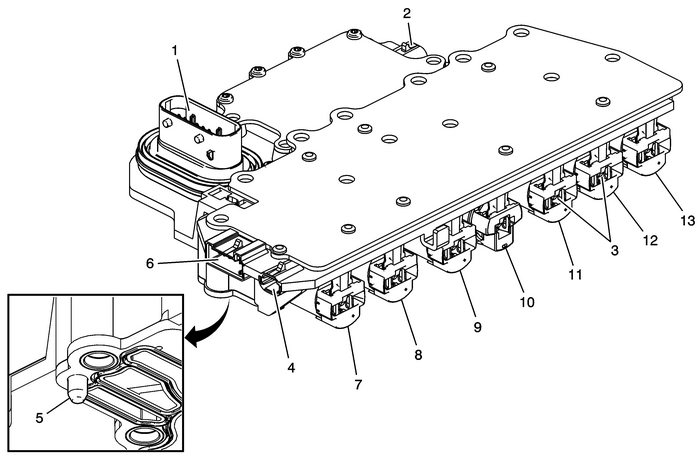 If the resistanceof any solenoid valve is not within range, replace the Control Valve Body Assembly.Inspect the 2-control solenoid valve assembly filter plate retaining tabs-(5) forcracks and ensure proper tension when filter plate is attached. Note:The connector on the TCC pressure control solenoid valve-(8) will be either clear/transparentor yellow. The clear/transparent connector will have a color contrast when comparedto the connectors on pressure control solenoid valve-2-(11) and pressure control solenoidvalve-4-(12).